Hayfever is not always all about sneezing and feeling bunged up as the eyes usually suffer too and often the first signs of a hayfever ‘flare-up’ can be seen in the eyes and the surrounding area so it is important to take care of the eyes as a precaution and to make sure they don’t suffer unnecessarily. Good eye hygiene is very important in protecting the eyes and making sure they stay in tip-top condition and this is especially true when hayfever season is here and extra care may need to be taken. When bathing the eyes use plain warm water and cotton wool or cotton pads (these are usually better as the chances of small cotton fibres shedding and migrating into the eye are smaller than with plain cotton wool).The eye should be cleaned using one wipe per piece of cotton and the motion should start from the inner corner of the eye going out towards the outer corner and discarding the cotton after each use. If your eyes feel gritty and tired and become irritating they may benefit from a gentle wash using specially formulated eye washes or eye drops that can be bought from many pharmacies or optical specialists. These solutions are balanced with salts so that they do not dry out the eye or irritate the user further. 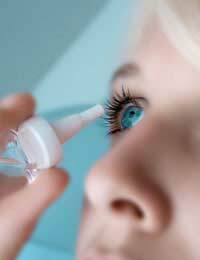 There are many ways you can calm and soothe your eyes even if your wear lots of eye make-up. Firstly, it is vital that eye make-up is removed everyday in order to let the skin breathe and have some exposure to the air. Using a product that is suitable for your skin (often hypo-allergenic products work well for hayfever sufferers), make sure all traces are removed every night before bed. It can be useful to try and use waterproof mascara as these will not run if your eyes stream with the symptoms of hayfever and are less likely to flake and migrate into your eyes. This is the same for eye-shadows as eye creams are probably more useful than powdered varieties for the same reasons. Smoky atmospheres are known to irritate the eyes so avoiding these sorts of environments is highly recommended in the fight against dry or sore eyes, especially during times when pollen counts are high or when you feel your hayfever is being aggravated. Pollution also has a similar effect so protect your eyes when you are travelling especially if you cycle through heavy traffic a lot of the time; try investing in some good quality protective eye wear or glasses that will help protect your eyes from pollutants.In bright light it is possible that your eye condition could become aggravated so good quality sunglasses with proven UV protection is a must to make sure they don’t suffer any more than they need to. Hayfever affects each person to a different degree and some suffer worse with their eyes than they do with a runny nose. By making sure you take good care of your eyes, these symptoms may be minimised and the episodes of hayfever might be lightly less severe. My son is 11 and suffers terribly in his left eye due to grass pollen. It stops him going to school in the summer most days. We are on the grazax immunotheapy treatment but it is only steroid eye drops which work. The eye is inflamed, his eyelid swells and the underside is like cobbled stones. Nothing, not water, or ice packs, or opatonol antihistamine drops or any other anti-histamine will work. We give him double anti histamine dosage and also montelukast! So the only thing is called LOTEMAX. Amazing but only for short spells.